Alfawise B1 MINI PC is powered by the Intel Core i7 - 6700HQ, a quad-core processor based on the Skylake architecture. In addition to four CPU cores with Hyper-Threading clocked at 2.6 - 3.5 GHz, the chip also integrates an HD Graphics 530 GPU and a dual-channel DDR4-2133/DDR3L-1600 memory controller. An upper mid-range, DirectX 11-compatible graphics card, GeForce GTX 960M is based on Nvidia's Maxwell architecture and manufactured in 28 nm. The GTX 960M offers 640 shader units clocked at 1097 - 1202 MHz (Boost), besides the fact that it comes with a 4GB Video RAM. 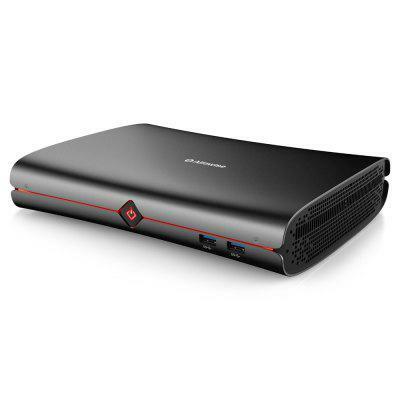 One of the check-off features of the i7-6700HQ-powered Alfawise B1 is the support for dual-channel DDR4 memory, meaning that you can install 2 x 16GB DDR4 RAM stick to the host. On top of that, the 2 M.2 slots bring access to both HDD and SSD memory of unlimited size. With support for 2.4GHz and 5GHz band, it can transmit higher amounts of data, and it's naturally less congested. Gigabit LAN can improve the net speed and the performance to a large extent. Want to be notified when the Alfawise B1 Barebone Quad Core Mini Gaming PC gets even cheaper? Make sure you snag the best price by entering your email below. We'll email you when the price drops, free! We're tracking the price of the Alfawise B1 Barebone Quad Core Mini Gaming PC every day so you know if that deal is really a steal! Check back for to check the best price for this product - and whether its current sale price is really the cheapest it's been! No Alfawise B1 Barebone Quad Core Mini Gaming PC coupons found!